Cache Memory is a special very high-speed memory. It is used to speed up and synchronizing with high-speed CPU. Cache memory is costlier than main memory or disk memory but economical than CPU registers. Cache memory is an extremely fast memory type that acts as a buffer between RAM and the CPU. It holds frequently requested data and instructions so that they are immediately available to the CPU when needed. Cache memory is used to reduce the average time to access data from the Main memory. The cache is a smaller and faster memory which stores copies of the data from frequently used main memory locations. There are various different independent caches in a CPU, which stored instruction and data. It is a type of memory in which data is stored and accepted that are immediately stored in CPU. Most commonly used register is accumulator, Program counter, address register etc. It is the fastest memory which has faster access time where data is temporarily stored for faster access. When the processor needs to read or write a location in main memory, it first checks for a corresponding entry in the cache. If the processor does not find the memory location in the cache, a cache miss has occurred. For a cache miss, the cache allocates a new entry and copies in data from main memory, then the request is fulfilled from the contents of the cache. The performance of cache memory is frequently measured in terms of a quantity called Hit ratio. We can improve Cache performance using higher cache block size, higher associativity, reduce miss rate, reduce miss penalty, and reduce Reduce the time to hit in the cache. There are three different types of mapping used for the purpose of cache memory which are as follows: Direct mapping, Associative mapping, and Set-Associative mapping. These are explained as following below. 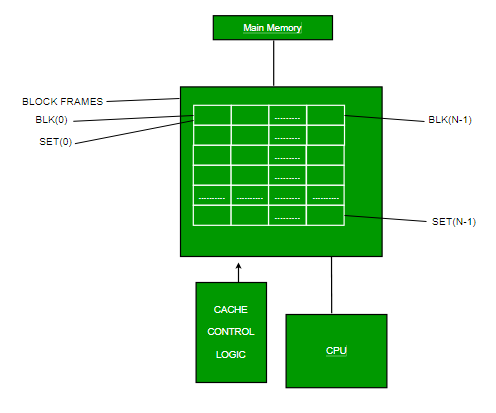 In Direct mapping, assigned each memory block to a specific line in the cache. If a line is previously taken up by a memory block when a new block needs to be loaded, the old block is trashed. An address space is split into two parts index field and a tag field. The cache is used to store the tag field whereas the rest is stored in the main memory. Direct mapping`s performance is directly proportional to the Hit ratio. 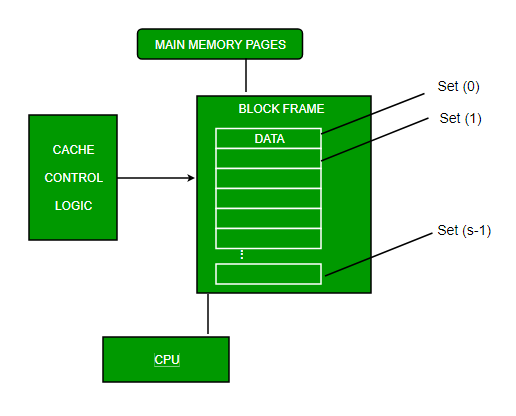 For purposes of cache access, each main memory address can be viewed as consisting of three fields. The least significant w bits identify a unique word or byte within a block of main memory. In most contemporary machines, the address is at the byte level. The remaining s bits specify one of the 2s blocks of main memory. The cache logic interprets these s bits as a tag of s-r bits (most significant portion) and a line field of r bits. This latter field identifies one of the m=2r lines of the cache. In this type of mapping, the associative memory is used to store content and addresses both of the memory word. Any block can go into any line of the cache. This means that the word id bits are used to identify which word in the block is needed, but the tag becomes all of the remaining bits. This enables the placement of any word at any place in the cache memory. It is considered to be the fastest and the most flexible mapping form. This form of mapping is an enhanced form of direct mapping where the drawbacks of direct mapping are removed. Set associative addresses the problem of possible thrashing in the direct mapping method. It does this by saying that instead of having exactly one line that a block can map to in the cache, we will group a few lines together creating a set. Then a block in memory can map to any one of the lines of a specific set..Set-associative mapping allows that each word that is present in the cache can have two or more words in the main memory for the same index address. Set associative cache mapping combines the best of direct and associative cache mapping techniques. Usually, the cache memory can store a reasonable number of blocks at any given time, but this number is small compared to the total number of blocks in the main memory. The correspondence between the main memory blocks and those in the cache is specified by a mapping function. A primary cache is always located on the processor chip. This cache is small and its access time is comparable to that of processor registers. Secondary cache is placed between the primary cache and the rest of the memory. It is referred to as the level 2 (L2) cache. Often, the Level 2 cache is also housed on the processor chip. Since size of cache memory is less as compared to main memory. So to check which part of main memory should be given priority and loaded in cache is decided based on locality of reference. This says that there is a chance that element will be present in the close proximity to the reference point and next time if again searched then more close proximity to the point of reference. In this Least recently used algorithm will be used. Whenever there is page fault occurs within a word will not only load word in main memory but complete page fault will be loaded because spatial locality of reference rule says that if you are referring any word next word will be referred in its register that’s why we load complete page table so the complete block will be loaded. Que-3: An 8KB direct-mapped write-back cache is organized as multiple blocks, each of size 32-bytes. The processor generates 32-bit addresses. The cache controller maintains the tag information for each cache block comprising of the following. 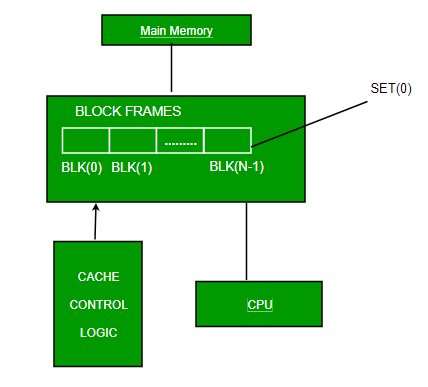 As many bits as the minimum needed to identify the memory block mapped in the cache. What is the total size of memory needed at the cache controller to store meta-data (tags) for the cache? 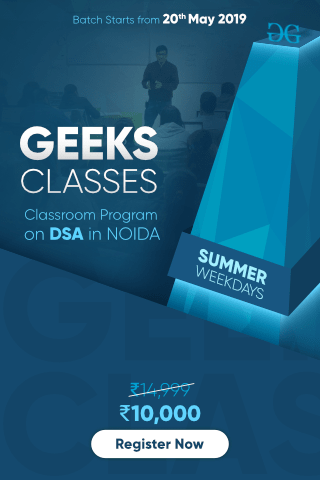 Article Contributed by Pooja Taneja and Vaishali Bhatia. Please write comments if you find anything incorrect, or you want to share more information about the topic discussed above.